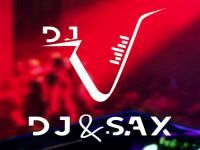 "DJ Who Can Also Play Saxophone"
Required by many venues, DJ & Sax DJ-V has a current PLI policy with National Association of Disc Jockeys in the amount of £10 million. Also required by many venues, DJ & Sax DJ-V has supplied satisfactory evidence of holding current PAT inspections of their equipment dated within the last 12 months. A Method Statement, outlining DJ & Sax DJ-V&apos;s Health & Safety procedure for setting up disco equipment has not been supplied. Why do people choose to book DJ & Sax DJ-V? Saxophone playing and really good correspondence to arrange the booking. Matched criteria given. Good feedback. Plus additional saxophone playing sounds good. 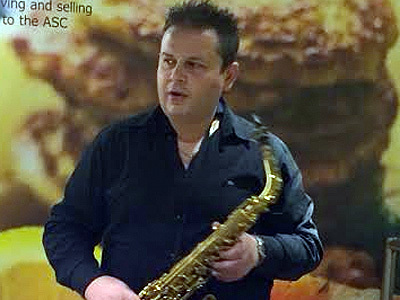 "Vlatko was absolutely exceptional, far exceed all of my expectations He arrived promptly when he was expected, set up quickly and delivered a great evening, his sax playing was out of this world too. Honestly the best DJ I have ever come across for this kind of event. Highly recommended!" "Thank you soo much for this fantastic review "
"Exceptional service and excellent Saxophone accompaniment! Really made our anniversary party rock!! Two of the guests have already booked him for their events too!" "A great sax player, added a difference to the event"
"Fantastic, excellent music, lighting brilliant, saxaphone playing was awesome, we had such a great time, ALL of our guests loved Vlatko, he was fabulous and the music was stunning, and so I would HIGHLY recommend this Dj, he was thoughtful and considerate to our tastes and choices of music, EVERYONE was up dancing, from 5 months old baby wiggling to 86 year old father in law, FABULOUS/FANTASTIC/SPECIAL, cannot praise Vlatko enough"
"Valtko is an exceptional DO and musician. He played the Sac very well and it made the entertainment feel classy and gave a unique feel to our event." "I would highly recommend DJ-V! A really nice and helpful guy! His saxophone playing is amazing - all my guests loved him. His tracks were perfect for my party - took care to play all my advance requests. He helped to make my party a special night to remember!" "Vlatko was friendly and professional from the outset. He was clear about the booking procedure and the party options he was offering. We sent our playlist ahead of time and on the day he just got on with the job. He pitched his involvement well with 11 year-olds (i.e. not intrusive) but was helpfully proactive in offering extras (a couple of party games) and accommodating our extra requests. I would recommend him without hesitation." "Vlatko did a great job. Organised our playlist, took on the spot requests and made everything on the night easy." "I would highly recommend Dj & Sax DJ-V. His saxophone playing was really good & made a great talking point amongst my guests. He stuck to my likes & dislikes of music, not playing certain songs without my say so. Good value for money." "I would use him again. Good music and got the kids dancing. Sometimes the music was a bit loud but as we were in a residential area, no complaints." "I wouldn't hesitate to recommend this DJ, he was brilliant and playing the sax was an added bonus! Lots of positive comments from our guests." "I would without doubt recommend DJ Sax (Vlatko)... his interaction with the guests was great, the tracks provided were all there (including some very obscure Polish songs we sent in advance), and the Saxophone interludes were amazing!! Many guests asked me about where they could book Vlatko for possible future events. Overall 10/10, thank you!!!" "Thanks it was pleasure for me to play on your party"
"DJ V. Was brilliant, he was a lovely guy. Very helpful from beginning to end, he played everything I asked and more, your never sure when you book but my expectations exceeded more. He played the saxophone better than imagined and just made my friends family and of course myself a memorable one for many years to come, I most definately will be using him again and will reccomend to others. We still are talking g about his sax now. Wendy"
"Thank you for lovely review I realy apriciated, and was a pleasure for me to play on your party Thank you, Thank you, Thank You"
DJ & Sax DJ-V also offers a range of additional party services not directly linked to musical entertainment. Get FREE no-obligation disco quotes from DJ & Sax DJ-V and other DJs covering your venue. Take 2 minutes to fill in some basic details and we'll do the rest! If you are contacting DJ & Sax DJ-V about an event, it's always a good idea to include the DATE, LOCATION, EVENT TYPE, AGE GROUP and TIMINGS to speed things up!